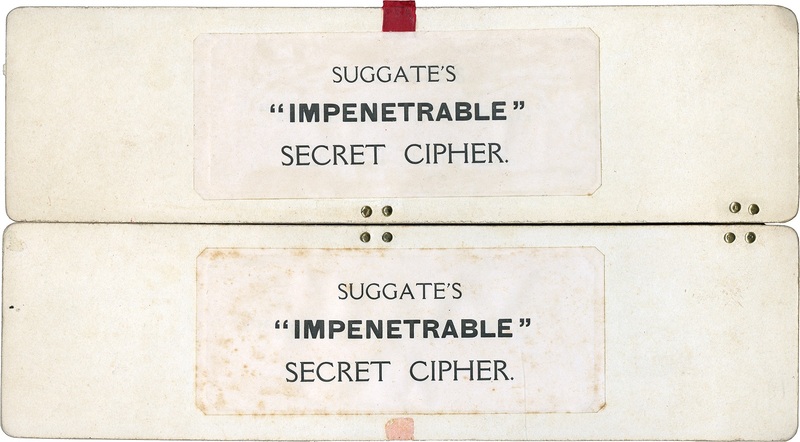 Who knows something about Suggate’s “impenetrable” cipher? 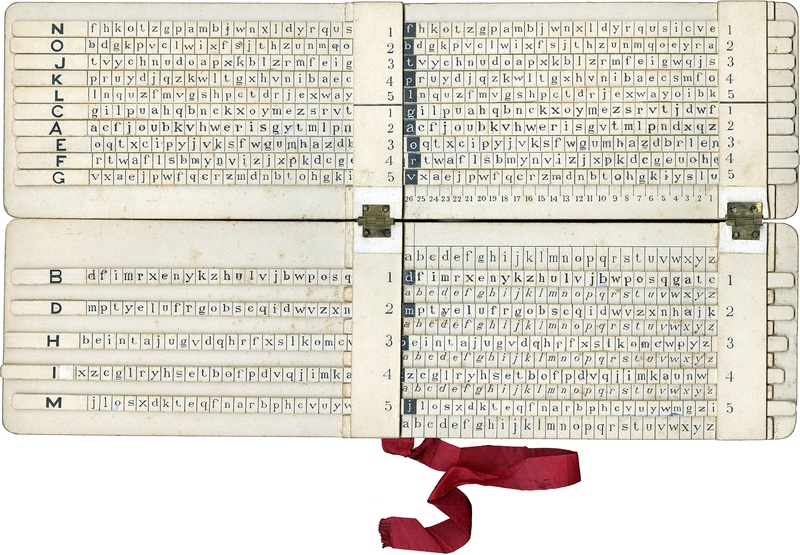 Crypto collector Glen Miranker has come across an interesting strip cipher device. He can’t find any information about it. Can a reader help? Last Saturday, I received an email from San Francisco based cipher machine collector Glen Miranker, whom I have met many times at crypto history conferences. 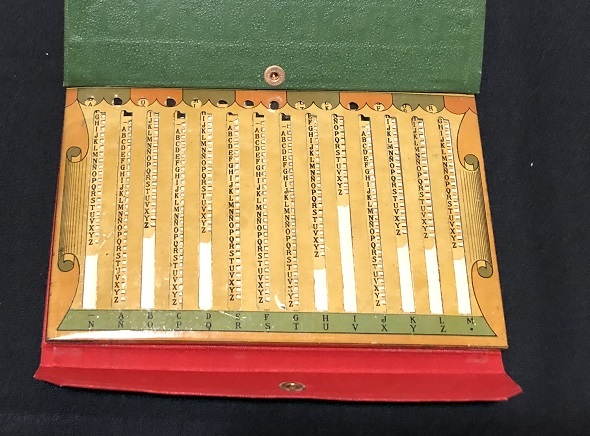 Glen has come across a crypto device that was discovered in a London antiquarian book shop in 2018. It’s named “Suggate’s ‘Inpenetrable’ Secret Cipher”. … bears the address of the Secretary of the British Admiralty in London. My guess is that the inventor of the device sent a prototype to the admiralty, hoping that his tool would be useful for the military. Things like this happened quite often. There are a total of 15 movable horizontal strips, a group of 10, a second group of 5. Each strip has 52 characters bearing two identical copies of the alphabet. Each strip appears to be a unique, manually picked random ordering of the letters of the alphabet. Manually is conjectured as there are no repeated digraphs or trigraphs among the strips. The group of 5 strips are separated by a strip sized gap. The gap has a fixed alphabet with the 26 letters in alphabetic order and with the same spacing as the letters on the strips. A few of the letter positions on the strips appear to have been whited out and a new (?) character drawn in. Any letters that were corrected on the right side of the strip, match the character on the left side of the strip and vice-versa. So it would appear that the corrections are simply to “typographical” errors. The fixed vertical strip (under which the strips slide) divides the 15 lettered strips in half horizontally and labels the top 10 strips 1–5, 1–5 and the lower 5 strips 1–5. 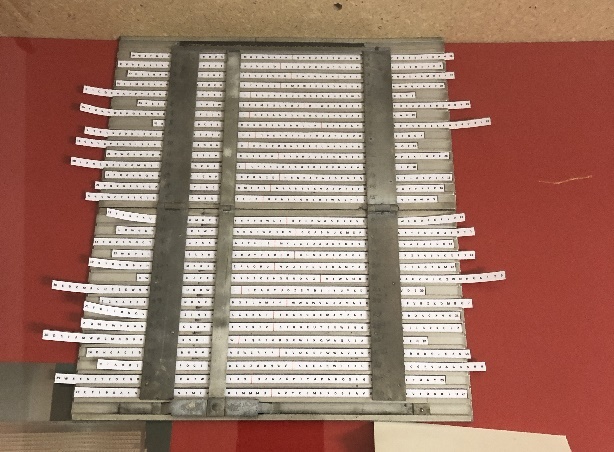 The “Suggate Cipher Device” has at least one feature I have not seen on strip cipher devices: two groups of strips, one of five strips and one of ten strips. Also, the group of five strips is bounded by six fixed “clear text” alphabets: the first and sixth appear to be block letters, the second through fifth are italic (?). Glen and I have not found any information about the Suggate strip cipher anywhere. It appears to be a very rare device. 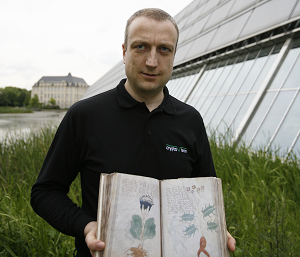 Perhaps, the specimen that was sent to the British Admiralty is even the only one that ever existed. In addition, it is not clear how exactly the device worked. If a reader can help, please let Glen and me know. 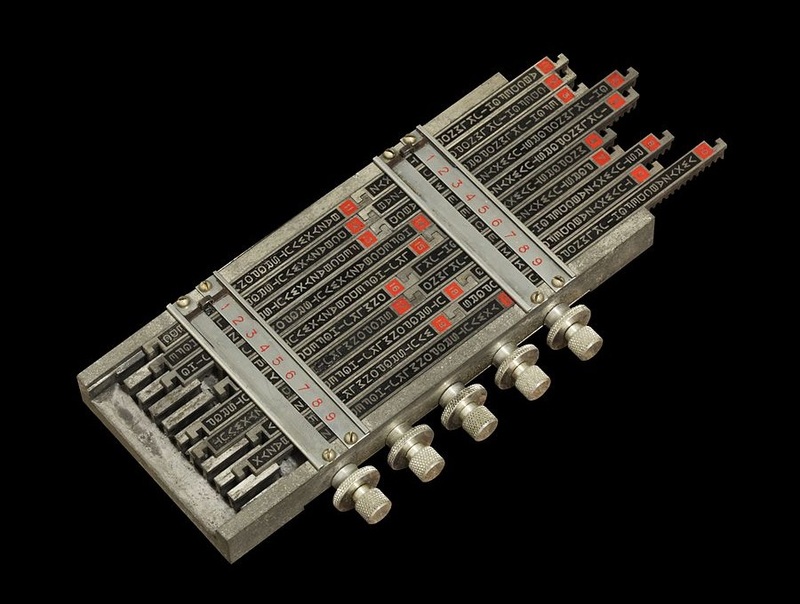 Further reading: Who knows anything about this rare encryption machine? 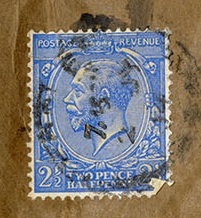 The postmark: 2 JY 14 = 2 July 1914 (see this example: http://www.mapf.co.uk/Pages/Articles/WWI/warPC.html). 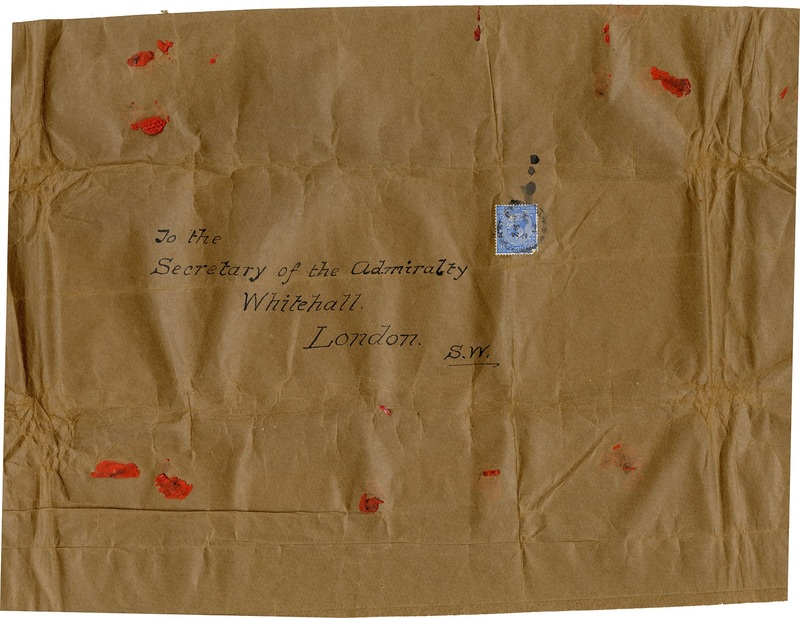 Hence the envelope was sent before the outbreak of WWI. The letters on the strips are not random. There is a pattern used which maybe can be the instrumental in figuring out how this device worked. Perhaps this is something worth looking closer at. Well, I think that the stamp shows King Edward VII, who only reigned from 1901 to 1910. Unfortunately, I can’t find an exact match with the stamp. The stamp shows George V.
@Thomas. I wondered about George V but all the stamps I could find had a 3/4 view instead of the side view. He was King from 1910 to 1936. The first time a strip device was described seems to be Arthur J. Hermanns article “Nouveau Cryptographe Construit d’apres le Systeme Bazeries” from 1893 (Revue Scientifique, 10, 1893). 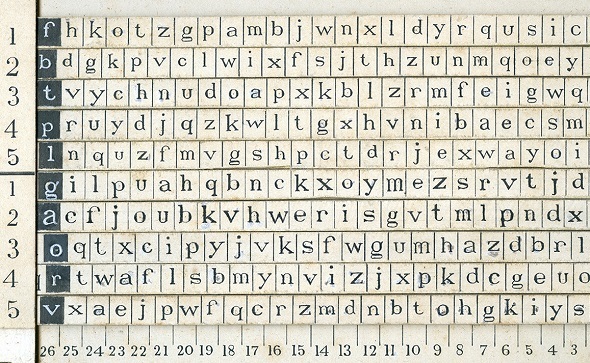 The US cryptologist Captain Parker Hitt desribed a similar strip cipher device based on peeling off the scrambled alphabets from Bazeries’s cipher cylinder in a memorandum from December 1914, https://books.google.de/books?id=ou1ADwAAQBAJ&pg=PT123. So Suggate’s system devised prior to July 1914 shortly preceded Hitt’s idea which later lead to the development of the M-138/CSP-845. Maybe – though there is no evidence – it was Alfred Suggate, an engineer who had written this book in 1912: https://catalog.hathitrust.org/Record/002013576. In 1914 he lived in Beccles, Suffolk. Unfortunately, the rest of the postmark isn’t legible. To check if it was Alfred Suggate: His will from 1934 is kept by the Suffolk archives: http://www.suffolkarchives.co.uk/collections/getrecord/GB175_1609_2_2., as can be senn on their site, they can provide much more documents concerning him. Since only a matching pair were made, as suggested…It may alter in real time the other one….like what Einstein didn’t like….If you move the object spin this way in position 1….regardless of position 2, the matching paired object particle..anti..whatever will spin always and at the same time in the opposite direction?